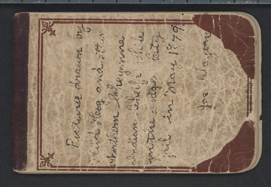 This small notebook contains drawings by Northern Cheyenne Indians who were confined in jail in Dodge City (Ford County) in 1879. The State of Kansas was trying the six Indians (Wild Hog, Run Fast, Frizzly Head, Young Man, Old Man, and Crow) for murders committed the previous year. In September 1878, chiefs Dull Knife and Little Wolf left Indian Territory with some 300 Cheyenne bound for their homeland north of Kansas. Atrocities committed during the band's trek through the state prompted a severe response from authorities, culminating in a standoff in Nebraska. The so-called "Dull Knife Raid" of 1878 proved the last major conflict between whites and Indians in Kansas. These drawings are often called ledger art. Dora A. Clayton of Denver, Colorado, donated this notebook to the Kansas Historical Society in 1939. Her husband, James Clayton, was clerk of the Indian Claims Commission created by the Kansas legislature in 1879 to investigate the losses resulting from the 1878 raid. The drawings appear upside down in the original beginning with pages 28-29 to the end. We rotated the images of these pages 180 degrees to make viewing easier. These drawings can be grouped with other sources related to the last Indian raid in Kansas. Other selections include a picture of the six Cheyenne who were put on trial, a letter by William Sutton (prosecutor), a newspaper article providing the native perspective, and a map of the Cheyenne's route through Kansas. This story can be particularly useful for demonstrating how native groups resisted the reservation system.